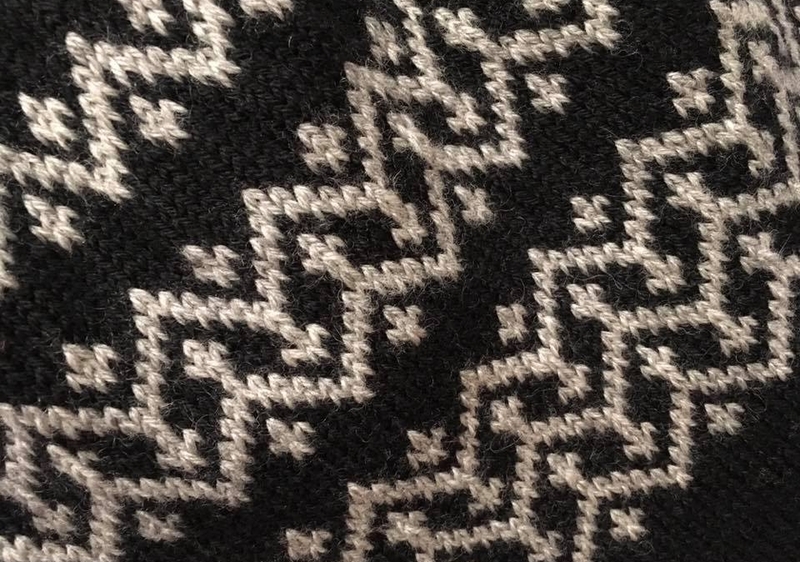 Maybe, Baby is a new design that debuted at Knit Camp in November 2018. 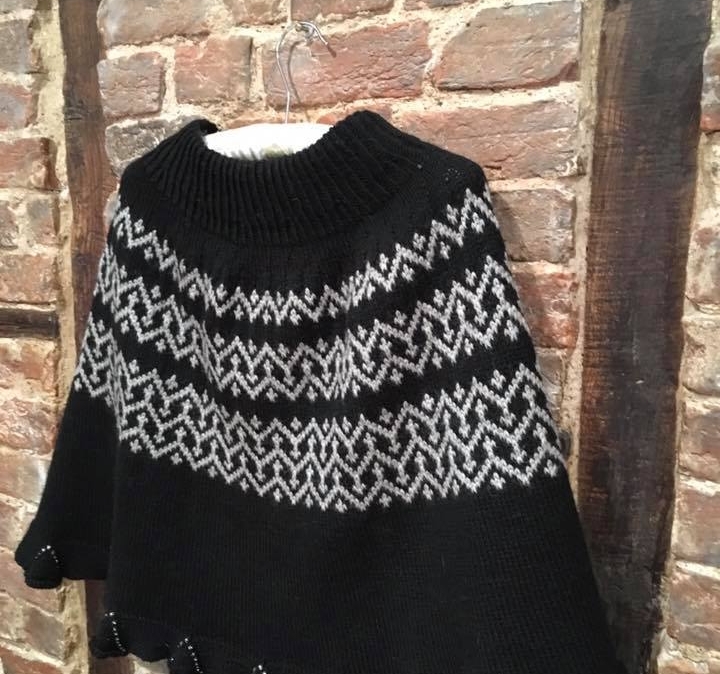 It is a sweater-top capelet. It is knitted in the round and also flat. I rate it as easy – moderate. It ends with a modest vent to allow arm-ease and a beaded insert hem. There is only one chart and this is easy. It comes in two sizes, and these allow it to fit UK dress sizes 8 – 18. It is fitted over the shoulders and upper arm. All the Fairisle is knitted in the round. It uses DK wool, and I used Mondial Sport Superwash. 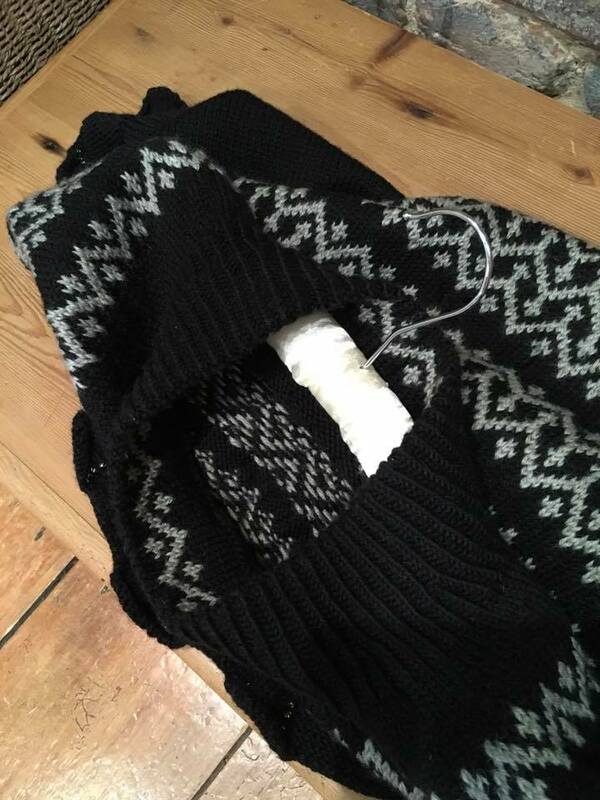 It is knitted entirely in one piece and the only sewing is slip-stitching the folded collar down inside. It is a new venture for me, in that is almost a garment. The top portion of MB is a sweater top, knitted in the round and from the top down. There is also a ‘secret’ Fairisle band that is inside the folded down collar. This is there for two reasons. First, I like hidden gems in a project – something that only you know of, or which might just be glimpsed. Second, this is the chart. There is only one chart, despite it appearing that there are two or even three. These are just this one, single chart, but repeated – stacked. Having this inside the neckline gives you a chance to practice it, and judge how well you like your choice of colours. It then progresses into twisted rib, which is obviously the best plain rib, and the first set of increases are included in rib. It’s subtle but it allows the ribbing to flare as the garment approaches the shoulders. 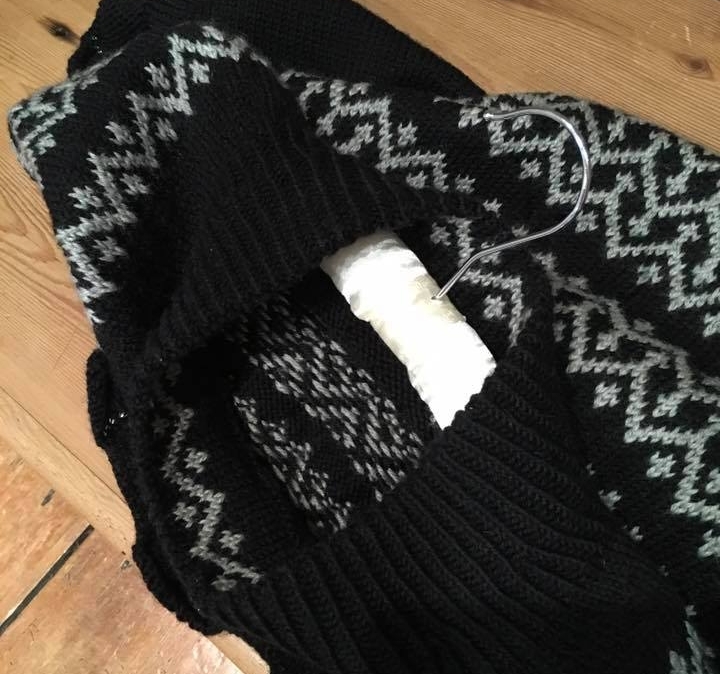 All the increases are fully worked out for you in each size and they all happen in between the Fairisle so this is easy. At about elbow point, the work ceases in the round and you begin knitting flat, stocking stitch, so for the first time really you have to purl. This section and the godet beaded hemline are all knitted flat. 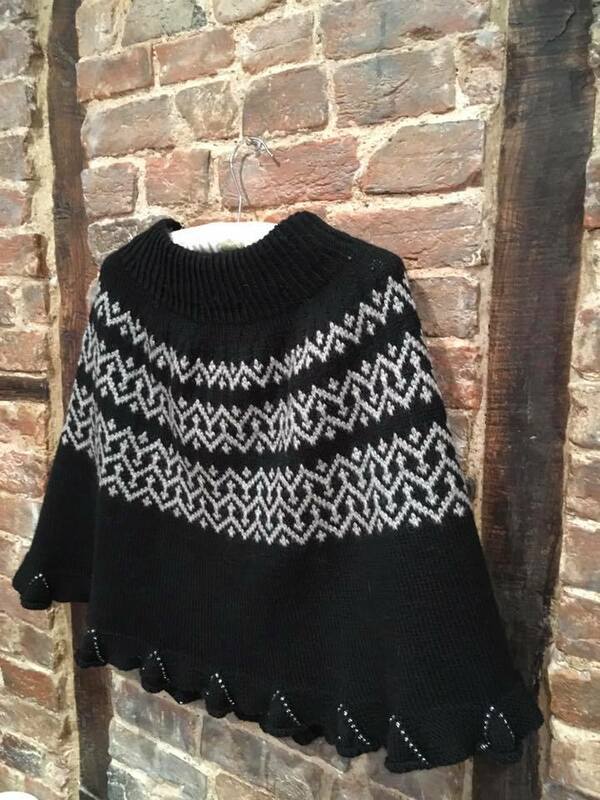 I love this design because it offers goals: the neck, the rib, the Fairisle bands and so on. Thus, it never really gets boring. I also love the fact that a lot of Knit Campers love it and several are being knitted or are complete. And finally, throughout the long, hot summer of 2018 as Kath and I worked on KC designs, Maybe, Baby just kept on coming back. I am not a natural garment designer and I will not use another ‘template’ so much of what we did, we did with trial and error. Kath worked at it tirelessly and I must have revised the design at least twenty times. For all that it is content-rich, this version is simpler by far than the first few. In the first iterations, we had intarsia (I know) inserts; we had these beaded too. We also had 3 different hem-lines/ending options and even up to the last ten drafts, I had these still in play. So then we came to, and simplified it. I know that looking at the images, and even if you read the pattern, it will look complex. But it really isn’t. It is just a series of stages, each one of which is simple. Add them together and you get Maybe, Baby. Maybe, Baby got its name because this working title was given to a project which I really thought would not make it to the final Knit Camp capsule. But it did, the name stuck, and I love it. I wear it and it looks great. You can buy Maybe, Baby here. The pattern includes matching Maybe, Baby mittens.